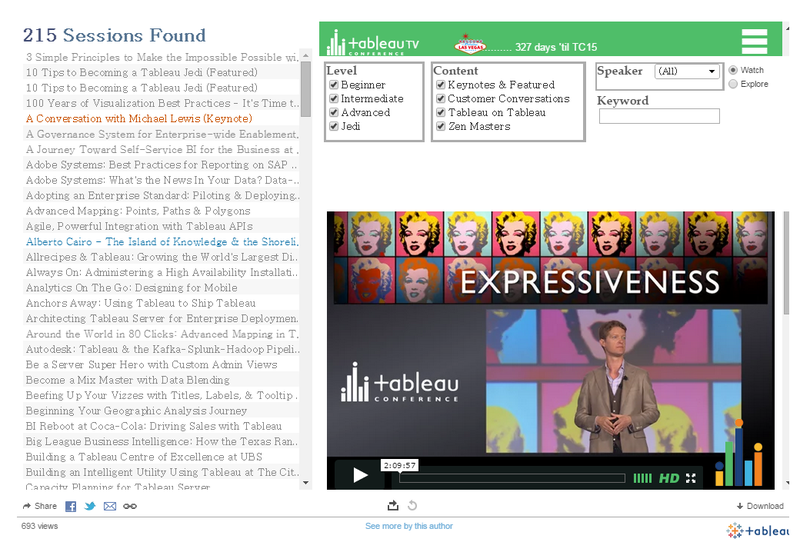 We’ve seen some people do some pretty creative things with Tableau Dashboards, but using a dashboard to broadcast our Tableau Conference content – why didn’t we think of that? Well, Keith Helfrich did - if you attended Conference this year, you can check it out here. One of the best parts about registering for Tableau Conference is that you get full access to all the sessions once it's over - meaning you can see sessions you may have missed out on, go back to watch and re-watch those sessions that you just couldn't take notes fast enough in or study the presenter to figure out who Darth Flashypants really is (and no, we're still not telling!). It's never too early to prepare for the next conference - want to register or learn more? Visit the TC15 site.